גודל התצוגה המקדימה הזאת: 423 × 600 פיקסלים. רזולוציות אחרות: 169 × 240 פיקסלים | 338 × 480 פיקסלים | 542 × 768 פיקסלים | 722 × 1,024 פיקסלים | 1,711 × 2,426 פיקסלים. Elihu B. Washburne. Library of Congress description: "E. B. Washburne"
פעל ב ניו יורק, וושינגטון די. סי. מיקום לידה/פטירה וושינגטון די. סי. וושינגטון די. סי. Deutsch: Elihu Benjamin Washburne (* 23. September 1816 in Livermore, Maine; † 23. Oktober 1887 in Chicago) war ein US-amerikanischer Staatsmann. 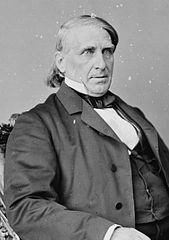 English: Elihu Benjamin Washburne ( September 23, 1816 – October 23, 1887) Born in Livermore he was one of seven brothers that played a prominent role in the early formation of the United States Republican Party. He later served as United States Secretary of State in 1869. Svenska: Elihu Benjamin Washburne, född den 23 september 1816 i Livermore, Maine, USA, död den 23 oktober 1887 i Chicago, var amerikansk republikansk politiker.